Every day, in the D4/6 unit of University Hospital, Amanda Goplen, APNP, FNP-BC, NP-C, coordinates the care of 14 to 16 patients on our inpatient family medicine teaching service. Goplen’s role is unique: as the service’s sole full-time staff member, she provides a continuity and presence that benefits patients, learners and staff alike. The family medicine inpatient teaching service admits patients from 13 UW Health family medicine community clinics and three Access Community Health Centers clinics (Wingra, Evjue and Erdman). Most patients are adults who have a broad range of diagnoses and who require general, nonsurgical care. The staff comprises an attending family physician, three Madison family medicine senior residents, a first-year Madison family medicine resident and a first-year psychiatry resident—each of whom rotate through it in one- to four-week blocks. The service offers residents an opportunity to care for patients through the outpatient to inpatient spectrum in a busy, high-volume center. It prepares them for future practice that, depending on their career goals, may include inpatient care in a similar setting. Since joining the service in November 2013, Goplen has formed relationships with all the nurses on the unit and many consulting physicians. This enables her to help rotating team members navigate the hospital system efficiently and provide continuity for patients, especially those who have complex medical or psychosocial circumstances and are hospitalized frequently. Medical directors Louis Sanner, MD, MSPH, and Nicole Bonk, MD, both describe her as not only an excellent clinician, but the “glue” that holds the service together with grace and good humor. “We are very fortunate to have Amanda there on a regular basis to help keep us updated on changes within the system, help provide an excellent communication pathway with our nursing staff, and provide additional teaching for our residents,” affirms Dr. Bonk. Her expertise and presence has not gone unrecognized. 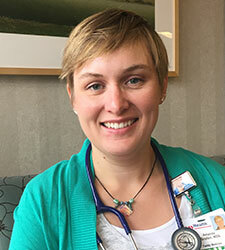 She was honored with a Clinical Teacher Award in 2014-2015 from the Madison family medicine residents, and was nominated for both a UW Health Advanced Practice Provider Excellence Award in Leadership and a Nursing Excellence Award in Leadership and Advanced Practice (in 2015 and 2017, respectively). Thank you, Amanda, for all you do!